As a visiting Fulbright scholar at USC in Los Angeles, I am going to explore the potential of interactive and animated information visualization. How may designers approach and work with complex data? 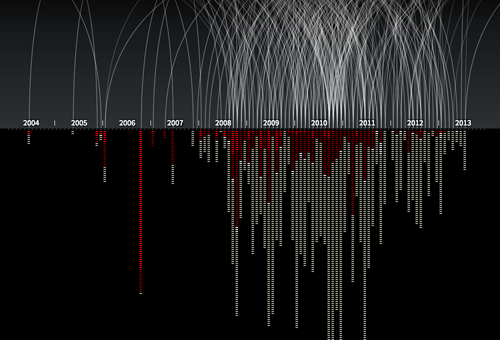 How may designers understand and handle the tension between data/exploration and narrative/story in dynamic infoviz? How can we understand these visualizations as not just ‘neutral presentations of data’, but as meaningful and persuasive design objects? How may data visualization move beyond flat, two-dimensional screen displays? The project is fairly open ended in terms of deliverables. The plan is to carry out several design experiments with real data, and document and analyze the result. For inspiration, I find it interesting to look to science fiction movies, as they often present novel interfaces for data visualization (even though many of them would not work well as tools for data exploration). What would happen if we used AR or holograms for data visualization? An additional aim is to enhance my programming skills, which will be necessary for working directly with the material at hand (interaction with data), and for creating working prototypes. So I suppose I will spend quite some time at Codeacademy. Further, I will use gigamapping as a technique for understanding and working with complex data. I am currently in the process of discussing opportunities for collaborative projects at USC. In addition, I have already an agreement with Difi (The Norwegian Agency for Public Management and eGovernment) to work with data from their large Citizen Survey (Innbyggerundersøkelsen). More on that later. I am also open for other cases, so feel free to contact me or suggest data that you think should be presented to the world in a visual and engaging form!